The operation forms part of the general approach taken to enhance the State’s built heritage. It was decided to group together two major public institutions falling under the authority of the Ministry of Ecology, Sustainable development and Energy, being the French National Geographical Institute IGN and Meteo France and locate them on the historic IGN production site in Saint-Mandé. The thinking concerning this three hectare site was carried out by the Ministry’s Délégation à l’Action Foncière et Immobilière (land management and real estate delegation). In 2006, a study was launched by the Val-de-Marne planning department (DDE) and the Saint-Mandé local authorities. It concluded that there was a need to group together the buildings belonging to the two institutions to the north of the site and initiate an urban renewal operation that would encourage an economic and social mix. 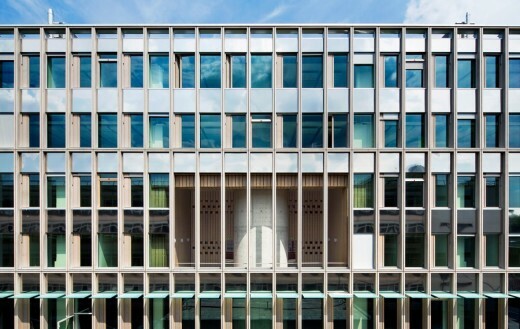 In 2007, a new building was designed along Avenue de Paris by the architect Laura Carducci for the relocation of the public institution’s management teams. It was handed over in 2012. This first building provided 14,200 m² of net plan area (SHON). 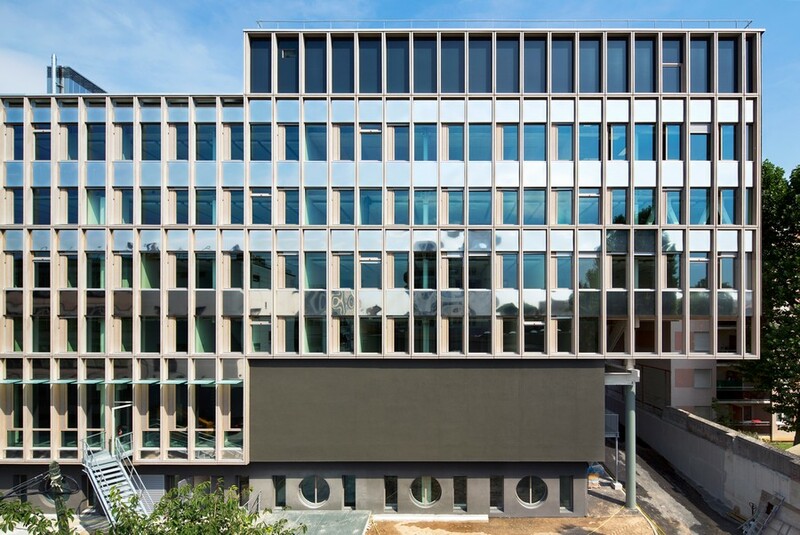 The financing was obtained from the sale of the former IGN Paris head offices on Rue de Grenelle and the commercial site on Rue de la Boétie. A programme comprising 50 social housing units and 100 student housing units was built along Avenue Pasteur on a 3,000 m² site and handed over in 2011. The programming for the remainder of the site was launched in 2009. It provided for the deployment to the north of IGN and Météo France activities and freed the remainder of the southern plot to develop an additional private business park. The mission was given to the Groupe 6 – Pro Développement – Sorane – Alma consortium. The layout had to be exemplary in environmental terms, both for the buildings and the site, as well as meet the objectives of the Ministry following the Grenelle environment forum. 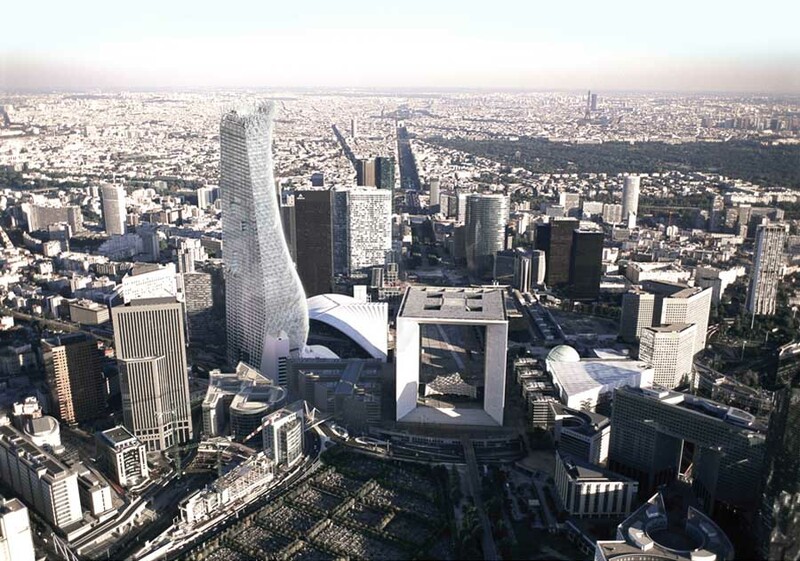 The proposed scenario therefore considers the potential of all constructions on the site and, in particular, the renovation of building B. The aim is to provide a sustainable approach to functional, architectural and environmental optimisation. Patrick Mauger proposed a project offering users a real living environment combining the functionality of modern workspaces with the friendliness of shared areas, while also providing solutions placing emphasis on sustainable development. 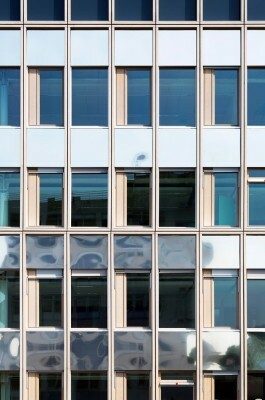 The work carried out on IGN’s building B forms part of the site’s general enhancement. 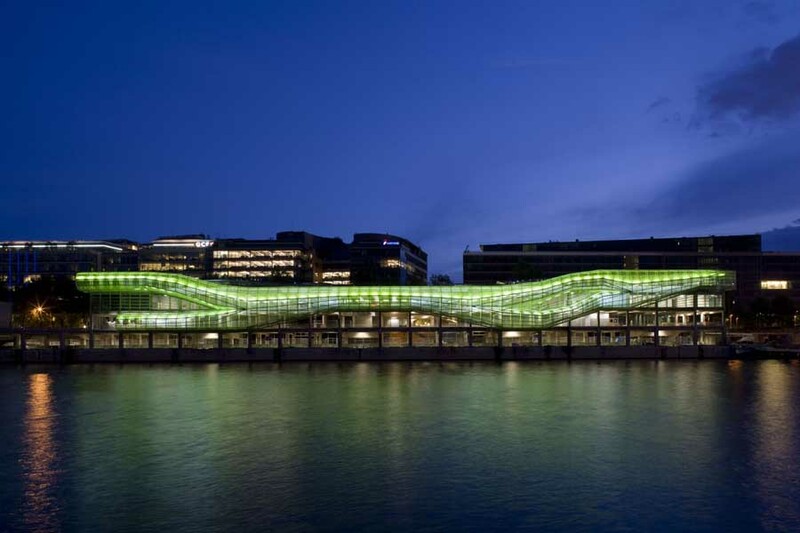 Patrick Mauger developed an architectural coherence taking into consideration the newly created building A along Avenue de Paris. The consultation programme required that the volume of the existing building be retained, alongside the creation of patios in its centre to introduce natural light, as well as surrounding 12 metre wide floor areas. This requirement led to the creation of a narrow, eight metre wide street between buildings A and B. As a result, the agency designed a building that was thicker to the south. This solution permitted the creation of a real patio between the two buildings and sought to create a single entity. 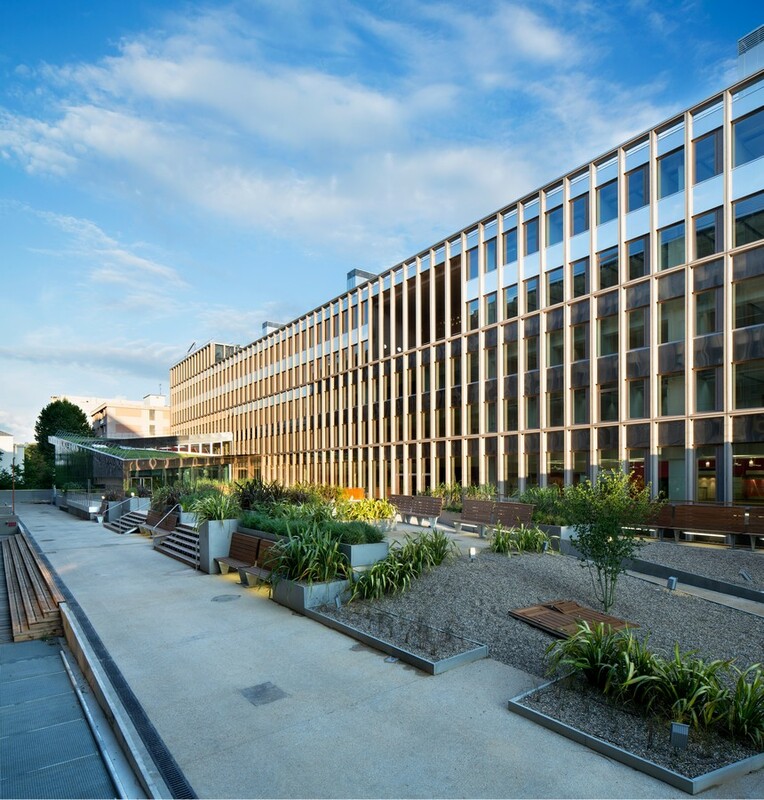 The width of building B was redimensioned to 18 m. A garden was introduced between the two buildings, allowing employees to profit from attractive views over the landscaped spaces. – works distanced from building A, with the conservation of the existing north façade, forming an acoustic screen during the demolition and construction works. To optimise the relation between the usable floor area and the net buildable floor area (SHON), the Architecture Patrick Mauger agency worked on the compactness of the structure, reducing the surface of its envelope and increasing the performance level of thermal exchanges. 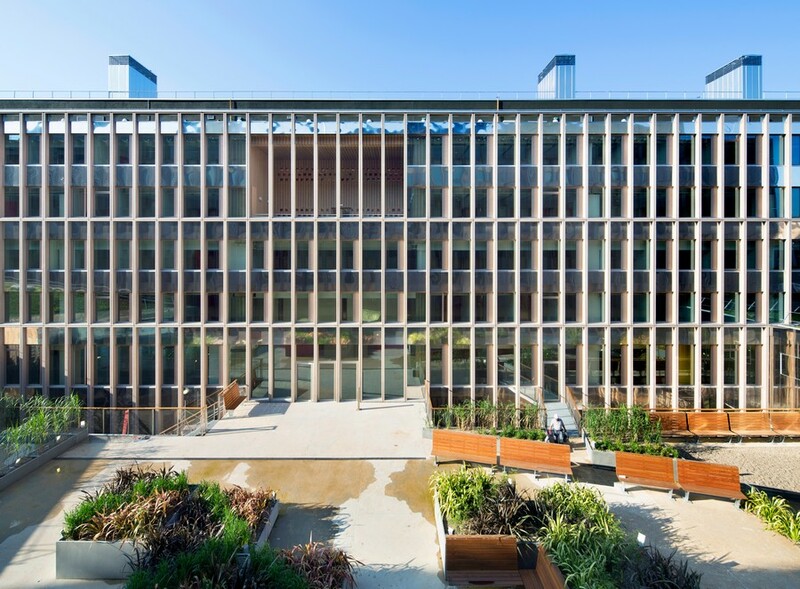 This research work into compactness resulted in making the environment brighter, better ventilated and more comfortable, offering planted spaces laid out on terraces and a potential for the allocation of additional square metres on the plot when compared with the programme’s proposals. 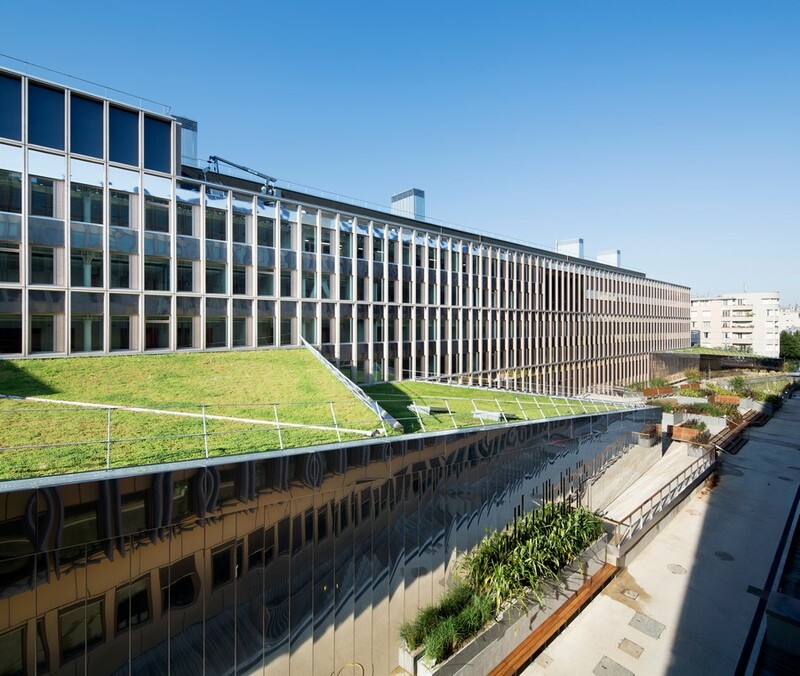 As a result, the programme which initially comprised offices and workshops as well as a first aid station shared by IGN and Météo France and an inter-company restaurant, has been enriched by making other spaces available to users. 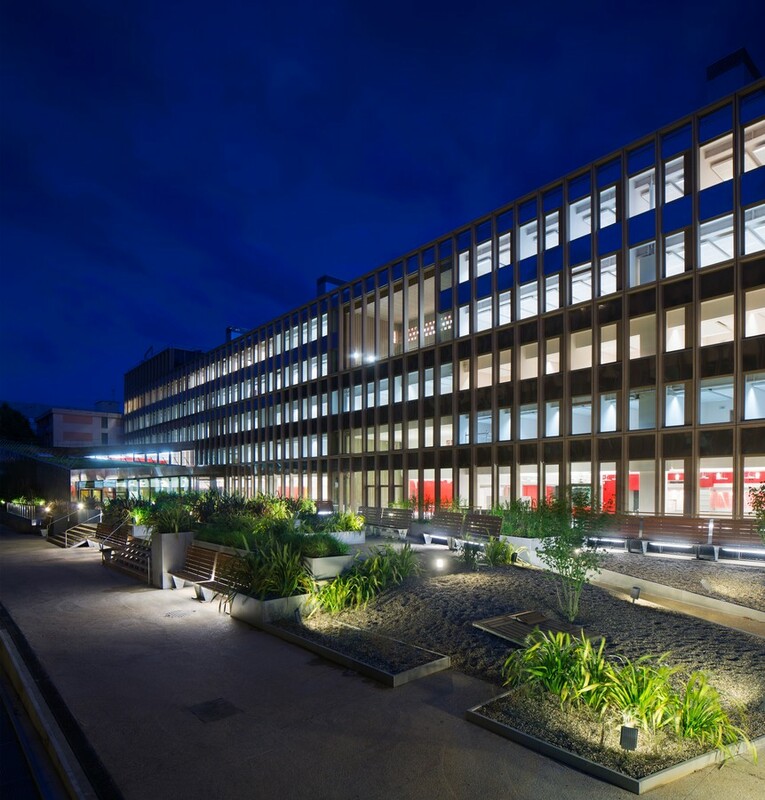 These include a multi-media library, a music room, a drawing workshop, a photo lab and three sports halls. 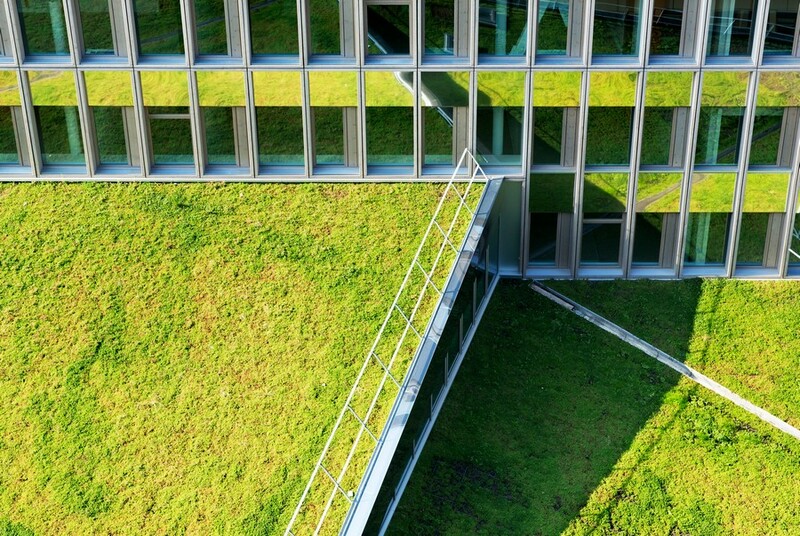 Offices are laid out over 18 m deep floor areas that reveal differentiated spaces. 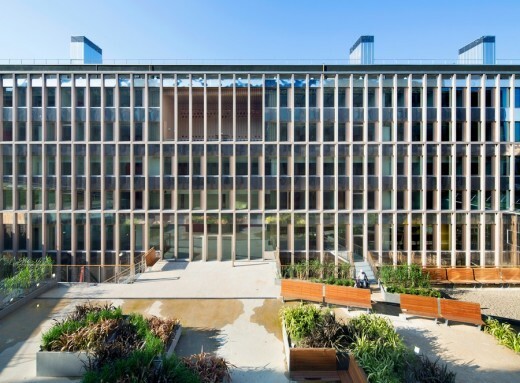 Profiting from adapted natural lighting, the offices are laid out along the façade. They are sequenced as one or two person offices or take the form of open space graphic workstations. 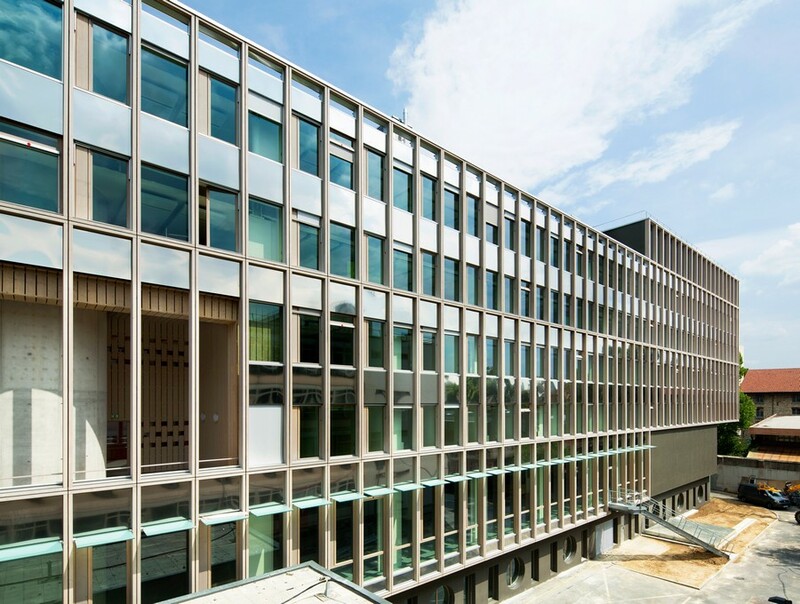 The depth of these offices is greater for those facing south than for those facing north in order to optimise the penetration of natural light to the rear of the rooms. 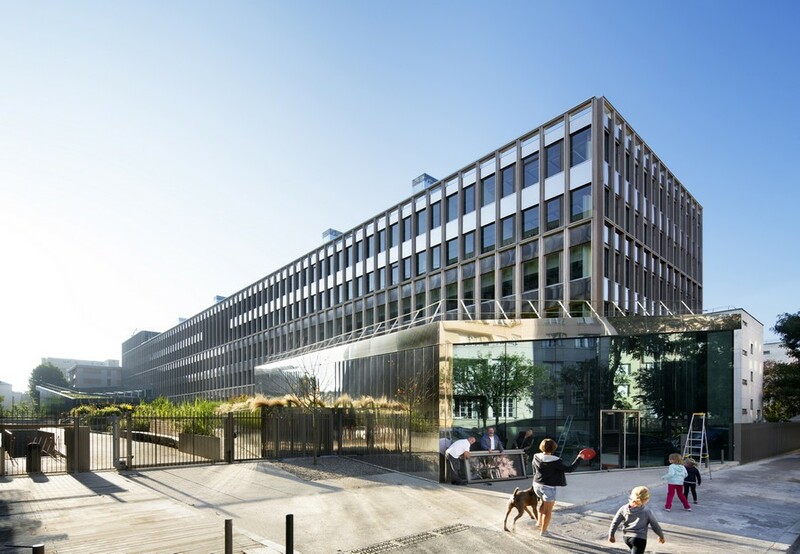 Extending the work carried out on behalf of the Conseil Général des Pyrénées-Atlantiques (Pyrénées-Atlantiques General Council) in the Nive barracks in Bayonne, the agency plans to let 50% of the central strip open onto the office circulation areas. This will permit façade to façade smoke extraction while the absence of extraction ducts will generate more office space. Areas used for shared functions are positioned along this central strip: common spaces, meeting rooms, general services rooms, coffee room, informal work areas, etc. This layout allows those working on the south and north sides to better see and communicate with one another. Functional quality is reinforced by the creation of interior patios halfway along the building. These permit users to relax and give smokers their own private area. The search for coherence is reflected in the work carried out on the envelope. 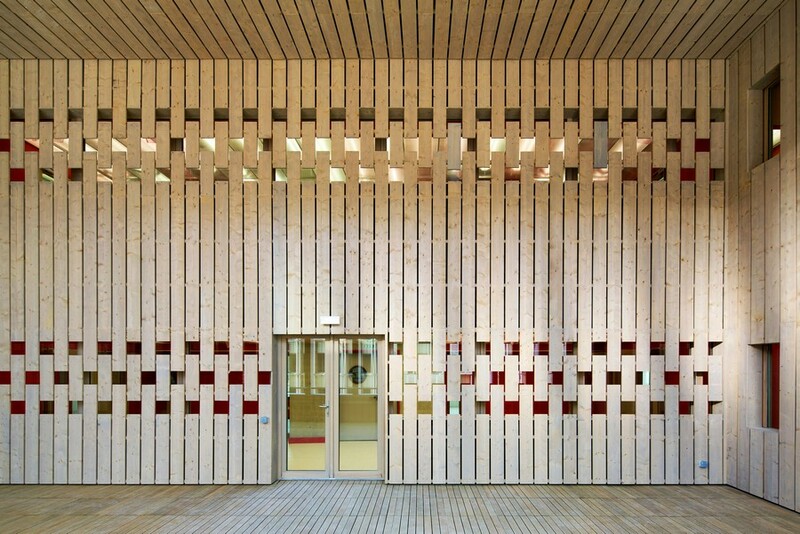 Using timber, it picks up the façade elements of building A. 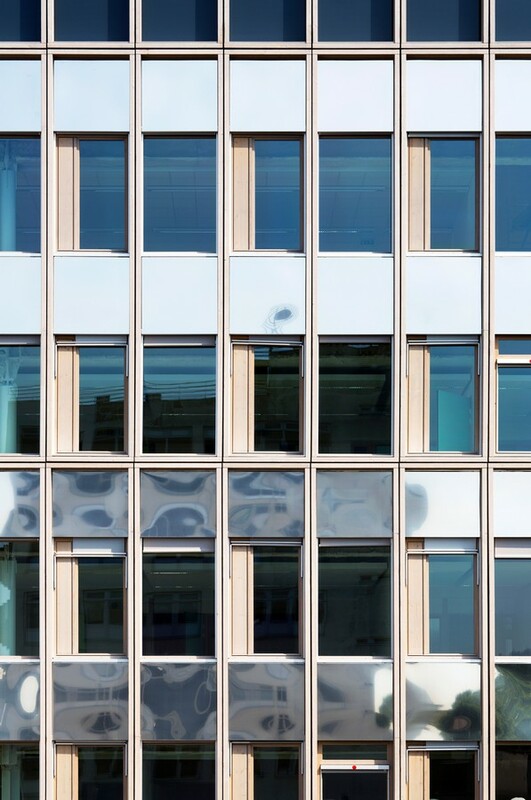 Creating a true osmosis between the two buildings, this approach reinforces the image of the two institutions. This envelope allows the existing structure to be insulated from the outside. The grids of the two buildings are compatible and their proportions almost identical (1.35 metres for building A and 1.37 metres for building B). The envelope also permits the relationship between the building, the street and the public space to be reworked to match that of building A. 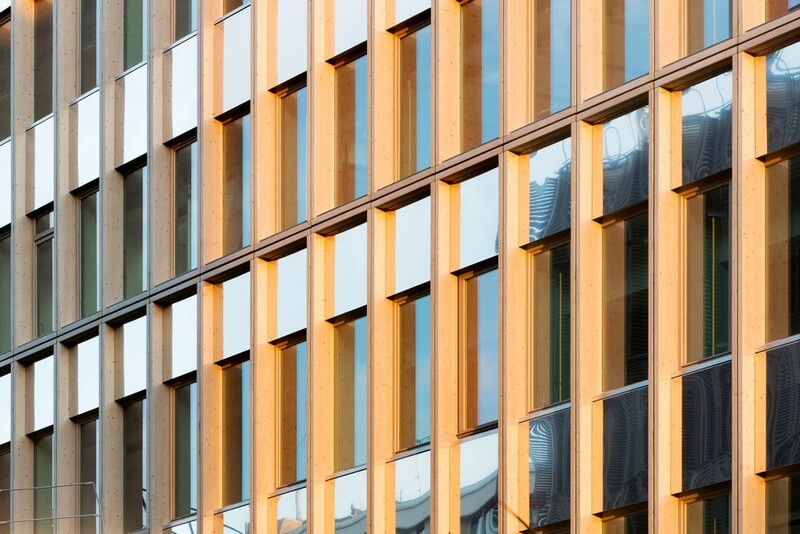 The glazed street level acts as a base to the timber façades. It contains the public reception area and consultation rooms of the Géoroom, being the future IGN-Météo France shop. 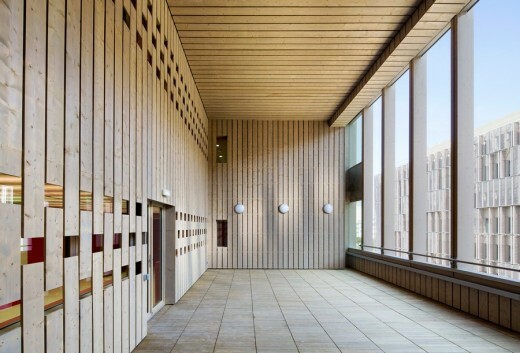 The considerable width of building B has been halved to offer a breathing space between it and building A whose timber façades echo one another. This space permits the creation of an interior garden that will provide the future on-site users with a landscaped area. An oasis of calm, it offers a setting for potential encounters in a relaxed green setting, directly connected to the restaurant and cafeteria. The Géoroom, the future IGN and Météo France shop, also has a privileged direct access giving onto this planted outdoor space. To remain as close as possible to the design of the timber façade developed during the studies, considerable work was required from the moment that construction began in January 2011 between Architecture Patrick Mauger (assisted by the VS-A façade engineers) and the SICRA-CBC contractor (as well as its Bluntzer subcontractor). 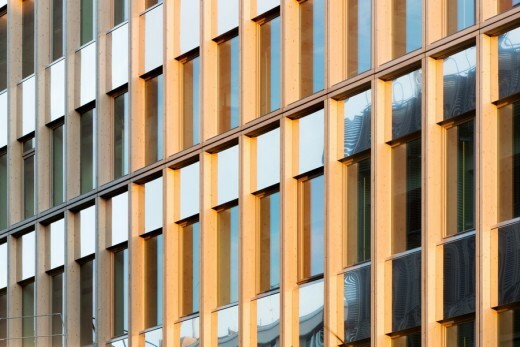 The installation of the façade elements began on 6 May 2013 and was completed in September 2013, being a total of five months to clad the entire 218 square metres of building B’s façade. Given the innovative nature of its design, this phase required numerous technical developments. The various exchanges were brought to a close by a final visit made to the Bluntzer factories in the Vosges to check the last construction and installation details. This was in order to guarantee an optimal sealing of the façade (all AWW tests – air, water, wind – as well as acoustic tests gave results better than those required by the theoretical objectives), alongside an increased installation quality for the 535 modules used to clad and unify the new concrete skeleton (existing) and building B’s steel structure (new extension). Each module has an exceptional dimension of 1.40 x 6.54 m, being the equivalent of two floor levels. A single person office covers at least two grids. – bright annealed stainless steel opaque breast walls. 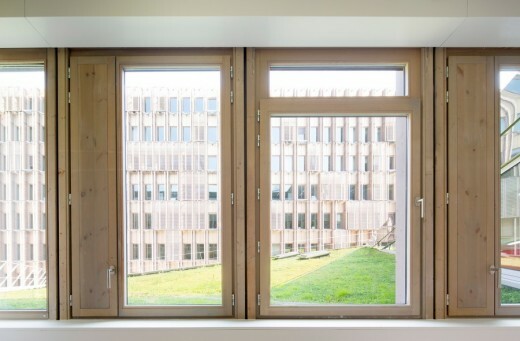 – plantroom modules on the upper floor clad with opaque tungsten coloured Emalit type glass.